On the afternoon of April 4, 1977, Georgia housewife Sadie Burkhalter Hurst looked out her front door to see a frantic stranger running toward her, his clothes ablaze, and, behind him, the mangled fuselage of a passenger plane that had just crashed in her yard. The plane, a Southern Airways DC-9-31, had been carrying 81 passengers and four crew members en route to Atlanta when it entered a massive thunderstorm cell that turned into a dangerous cocktail of rain, hail, and lightning. Forced down onto a highway, the plane cut a swath of devastation through the small town of New Hope. On June 12, 1972, a powerful explosion rocked American Airlines Flight 96 a mere five minutes after its takeoff from Detroit. The explosion ripped a gaping hole in the bottom of the aircraft and jammed the hydraulic controls. Miraculously, despite the damage and ensuing chaos, the pilots were able to land the plane safely. Less than two years later, on March 3, 1974, a sudden, forceful blowout tore through Turk Hava Yollari (THY) Flight 981 from Paris to London. THY Flight 981 was not as lucky as Flight 96: it crashed in a forest in France. On April 4, 1979, a Boeing 727 with 82 passengers and a crew of seven rolled over and plummeted from an altitude of 39,000 feet to within seconds of crashing, were it not for the crew's actions to save the plane. The cause of the unexplained dive was the subject of one of the longest NTSB investigations at that time. While the crew's efforts to save TWA 841 were initially hailed as heroic, that all changed when safety inspectors found 21 minutes of the 30-minute cockpit voice recorder tape blank. If you ever wanted a textbook example of Murphy’s Law in full effect this book is it! The sheer magnitude of combined miscalculations, misfortune and errors are astonishing. It led to the ditching of ALM Flight 980 into the Caribbean sea, just 35 miles short of its diverted destination. The only commercial airline to date to crash land in open waters. Author Emilio Corsetti painstakingly details not only the facts leading up to the mishap, but also paints us a picture of aviation life in the early 70’s as well as anecdotal snippets of American history during that time. Fred Filbrich did an excellent job narrating this true story which clocks in at just under 8 hours. His voice works perfectly for this genre and I found his reading entertaining and engaging. This is a very good book. It's fast paced and well written. I enjoy listening and watching shows about airline crashes and disasters, not for the crash itself, but for the cause of the accident and eventual fixes for the cause. As for this accident, it happened before I was born, so this is one that I haven't heard of before. 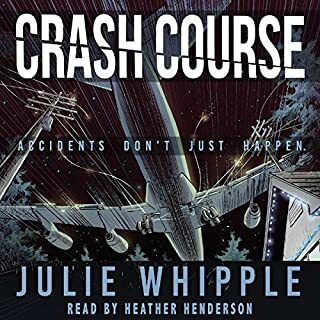 The author did a great job outlining the issues and events that lead up to the accident, the people involved in both the accident and rescue. The narrator did a great job. As I flew into SFO from PHX, I had a new perspective on air travel. I immediately found the life rafts. There were multiple and above the center aisle behind what looked like plastic attic doors. I kneeled and looked under my seat for the life vest. I turned off my audiobook as I listened intently for the instructions on how to inflate the life vest and made sure to get an aisle seat near the front cabin door. I wondered if my head would hit the tray table if I braced for impact. I now knew to wait to inflate my life vest until after I left the plane. I looked intently out the window as we passed over the bay and onto dry land in San Francisco. I could breathe again. This book will change how you travel, make you aware of your surroundings, and bring you one step closer to understanding what really makes for a safe airline and what doesn’t. 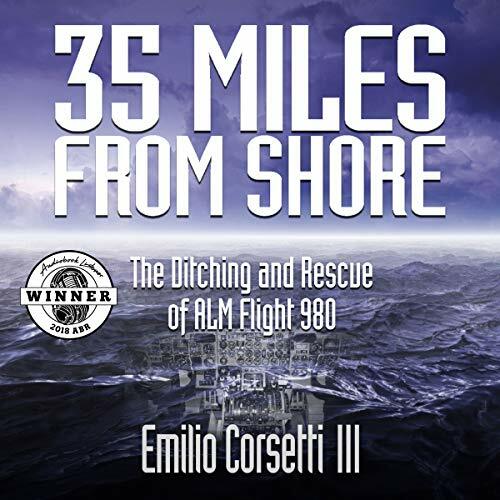 Emilio Corsetti III, in 35 Miles from Shore: The Ditching and Rescue of ALM Flight 980, starts with a strong hook, an airplane in the middle of the ocean that no one has come to investigate or pull out of the water because it’s a mile down. How did it get there? Why has it been down there so long? What happened? There are many directions Mr. Corsetti could have gone: a focus on the passengers’ point-of-view, the captain and flight crew’s, or the before and after on shore. 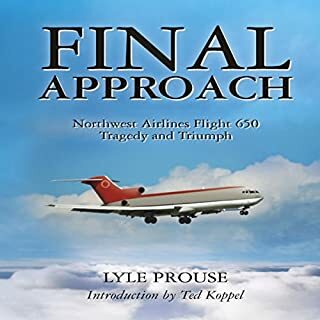 He managed to weave all of the pieces together from the history of the airline itself, to the pilot’s backstory, the dramatic event, and the aftermath. While the general recommendation is to start in medias res, in the middle of the action, to create a dramatic beginning, the snapshot of the plane in the ocean was enough to propel a reader into the story and once there, he or she would not be disappointed with the narrative. The premise is straightforward: Why did this tragedy happen? Emilio Corsetti III elevates the non-fiction genre to detective non-fiction where we learn everything about everyone in such a well articulated and compelling narrative that it doesn’t feel like we are in the classroom. Rather, we feel as if we are hearing the stories from multiple people as if we were the investigators ourselves. Corsetti III breathes life into technical jargon, complex procedural pieces, and turns what the mechanic sees into a vivid graphic through artful word choice and plain language. The tower dialogues gave the audiobook an authentic theatrical feel more script-like than book. The explanations were so clear such that any bit of minutia or jargon found an explanation. From explaining tunnel vision as cognitive narrowing to the rationales for certain pilot altitude and airspeed choices, throughout the book I felt as if I had a mentor, a coach, teaching me about being a pilot. This is truly a book for anyone, it respects the jargon and speaks to the aviation enthusiast, but it speaks to us on a human level. What is it like to go through such an ordeal? How does a communication breakdown lead to a life-altering mistake? How do different people respond? Because we are so invested in each character, know they are real; the last half of the book creates a satisfying closure to every thread of the story. It’s a rare author who can teach from the narrative rostrum with such detail as to both educate the reader and leave him looking around and appreciating the humanity in the giant machine of an airplane we take for granted. The irony of hell in a Caribbean paradise will not be lost on any of the readers. Is it worth reading? It’s worth listening right now. Fred Filbrich, the narrator, does a wonderful job with both the narrative and the dialogue. The book was more than an easy listen; it was one that I tried to fit in the spaces of time at the grocery store and on the way to and from work. Filbrich continue to press page-turning narrative with subtle elevations of his voice, empathetic caresses towards a tragedy, and the straightforward talk as if I was the only person in the room. It is the work of a consummate professional. 35 Miles from Shore is fantastically laid out for even a non-pilot like myself can understand. As a frequent flyer, I had never really considered on the things that go into what the pilots and stewards do to protect and make our travels comfortable. The ditching of ALM Flight 980 took place before I was born and was an event that I had not known had occurred. By the writing of this book, you can tell that the author is either a pilot himself or has a passion for planes based on his descriptions and language/terminology that is used, which makes this even better. The narrator brings this story to life (bad word to use) walking the listener through the details with energy and explanation. Great book! 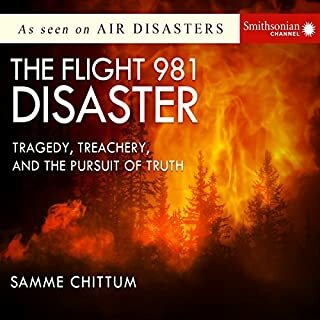 A Riveting Account of an Airline Disaster! Wow! The drama—the intrigue—is immersive in this historic ditching of an airliner, which was actually the only open-water ditching of a commercial jet ever. Hearing the radio transcripts of the pilot and the control towers drew me right into the moment. And, sound effects for the rescue choppers could be heard at times. I was impressed that the pilot made the call so quickly to make an emergency landing in the ocean. It was one of those moments where quick thinking saved the day for the 2/3’s of the passengers and crew that made it off the jet alive. Of course, I felt the airline had made many poor decisions that led to the need to ditch the jet. Corsetti gives a gripping account of the contributing factors, the people involved, the human side to the equation, and the chain of errors that led to the tragedy. But, he goes much farther; giving adequate geographical details, and describing the headlines of the day, as the accident took place in 1970. It reminded me of the attention to the world around him in some of Max Hasting’s books, such as Catastrophe 1914: Europe Goes to War. After pulling the passengers from the choppy waves, Corsetti describes how they recovered from the tragedy. Then he compares later similar accidents and how the Captain’s quick thinking had been commendable in retrospect. This is one of those books you start reading early in the day, and read straight through to the end. I had requested a free review copy of the Audible version, and found family members just as drawn to the story as I was. Fred Filbrich narrated as if he were on the scene. This was the first I’d read of his narrations, but he has several more I will want to check out. I rate the book a five out of five, and recommend it as highly interesting for the general reader. 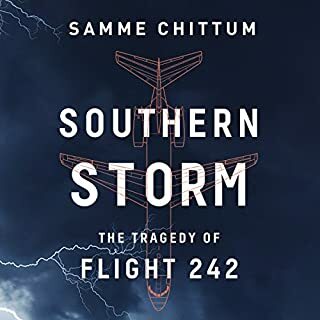 This is a true life account of a ditched aircraft in a turbulent sea; which includes the chain of events that led up to the ditching, the flight crew's heroic actions when the plan was ditched, the rescue operation and the fallout after the accident. Without being too much of a spoiler, what dismayed me was that the crew member who died in the ditching was honored as a hero, whereas the surviving crew were somewhat vilified, blamed and held more accountable than the higher ups that should of been held more accountable. It is an interesting account and I felt for the crew who got scapegoated while the administration skated. The administration decided to fly the routes before the extra fuel tanks could be installed on the planes. The crew received inadequate safety training for a ditching situation. The crew did not cause the fuel gauges to malfunction. And there were a whole bunch of other contributing factors to the mishap that were caused by executive decisions, not crew decisions. Even though this is not a true crime story, true crime buffs would probably like this book. The narration was professionally preformed. It was clear and sharp and well enunciated. A detailed tale of the ditching and rescue of a commercial airliner in the ocean. The listener is introduced to the people on board and the ones sent to help rescue them. I was twelve years old when this happened and no matter how hard I try I can't remember it happening. I like historical recounting of events. The narration was well done. The characters were well portrayed by Fred Filbrich. Yes, great narration and the book kept me glued till the end. I loved it! A compelling story which captured my fascination in air travel. Would you listen to 35 Miles from Shore again? Why? 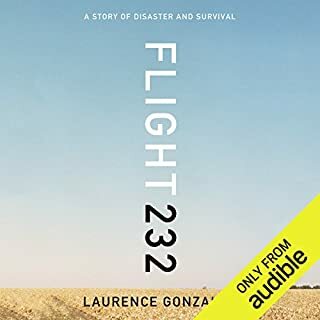 I will, because as a pilot, there is a lot to learn from the event - and as human being, it is a really interesting account of an incredible drama unfolding. What other book might you compare 35 Miles from Shore to, and why? 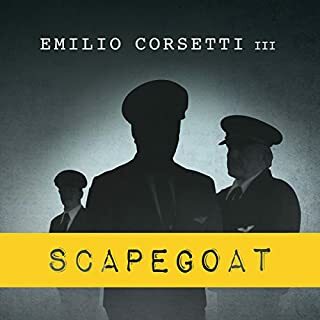 I was moved to buy Emilio's other audiobook, Scapegoat. Also excellent. Fred narrates brilliantly - all of them. The honesty in the writing. Compelling read - or listen.